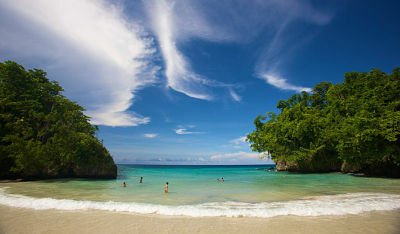 Home :: Jamaica Tours :: Montego Bay Tours :: Portland Tour, Highlight and Sightseeing Adventure. Frenchman’s Cove - One of the most beautiful coves in the world, with white sand beach. Reach Falls - One of the most spectacular natural waterfalls nestled in Jamaica, its spectacular beauty, unspoiled surroundings and crystal clear water. Titchfield Hill - An original residential area boasting Victorian architecture. Jamaica Palace Hotel & Gallery - A gallery of art, paintings and sculptures. Blue Lagoon - The legendary and most beautiful spot in the Jamaica, popular for swimming and bathing, were fresh and salt water meets. This is a journey you cannot afford to miss. Visit: Frenchman's Cove, Reach Falls, Errol Flynn Market, Musgrave Market, Titchfield Hill, Trident Castle, Jamaica Palace Hotel & Gallery and The Blue Lagoon (Attraction cost included). Ask a question about the Portland Tour, Highlight and Sightseeing Adventure.